Hello! 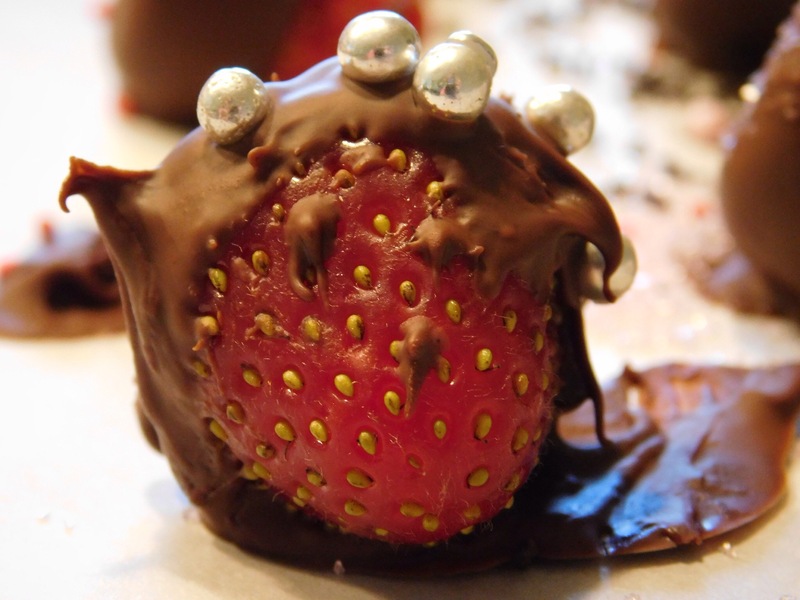 Today I am going to teach you how to make chocolate strawberry hedgehogs! Alright, you will need chocolate chips… any kind. I prefer dark chocolate. About a cup or so. You will also need strawberries however many, depending on how many you want. You will also need SPRINKLES! All sorts to make a variety of hedgies. (That’s what I like to call hedgehogs:) ) You’ll also need to put some parchment paper on a baking sheet. 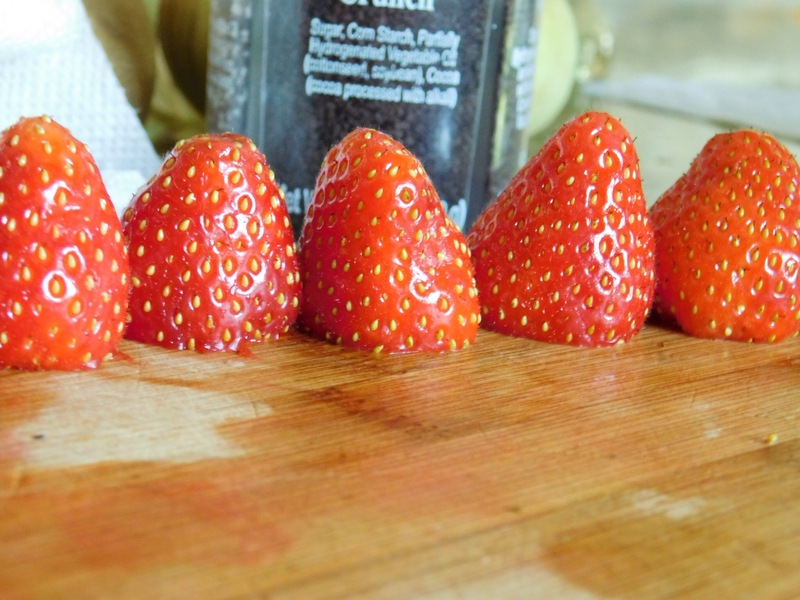 So first you cut the green leafy part of the strawberries off. 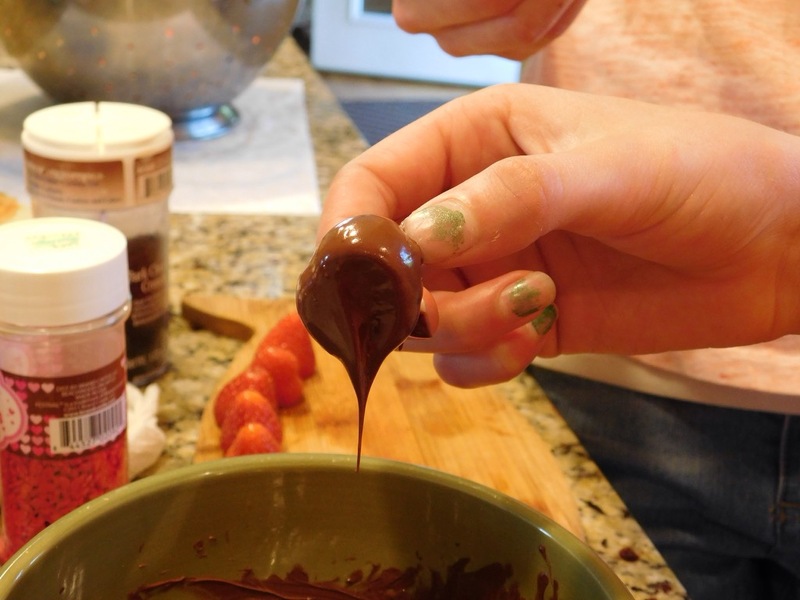 Then you pour the chocolate chips into a microwave safe bowl and heat them in the microwave for 30 seconds. After that, stir. You might have to add a tiny bit of canola oil to make it smooth. Keep microwaving it for 30 seconds at a time until smooth, stirring after each time. 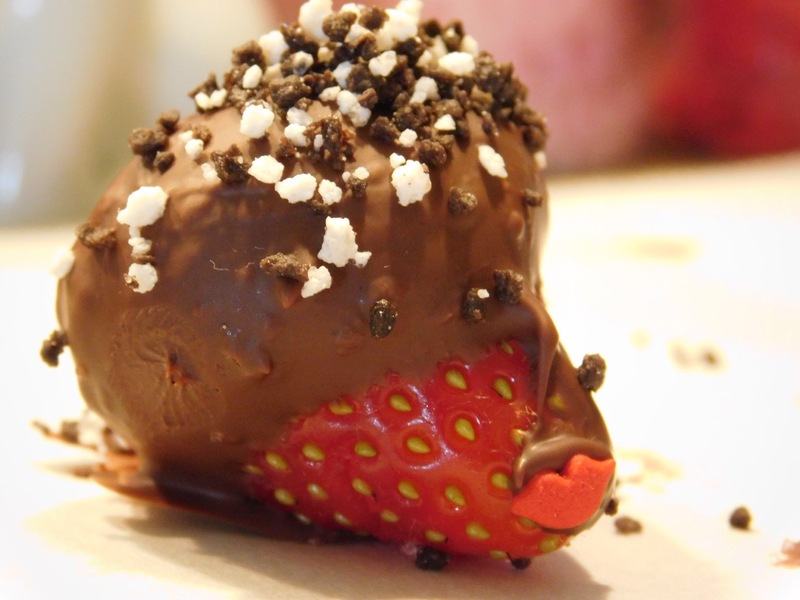 Dip 3/4 of each strawberry in the melted chocolate. Place each on the parchment. Here comes the fun part: decorating them. Here are some ideas for some cute hedgies. First, the classic hedgie. Use dark brown sprinkles. Small, thin cylinder- shaped ones or dark, tiny cookie crumbles. I put lips on this one! Oh, and to make a nose, just dip a toothpick in the melted chocolate and dab it on. Second idea: a mysterious alien hedgie. For my alien hedgehog I used big, silver ball sprinkles for the eyes! It looks strange. Also, put glittery pastel or white sugar on its back for an eerie look. I put lips on mine! He looks funny! Third idea: fantasy hedgies. Fantasy hedgies should be sparkly and beautiful! For mine, I used silver balls to decorate its back. But you can use anything sparkly, glittery or shiny when you’re doing fantasy! Haha! You can kinda see my reflection in the silver balls! 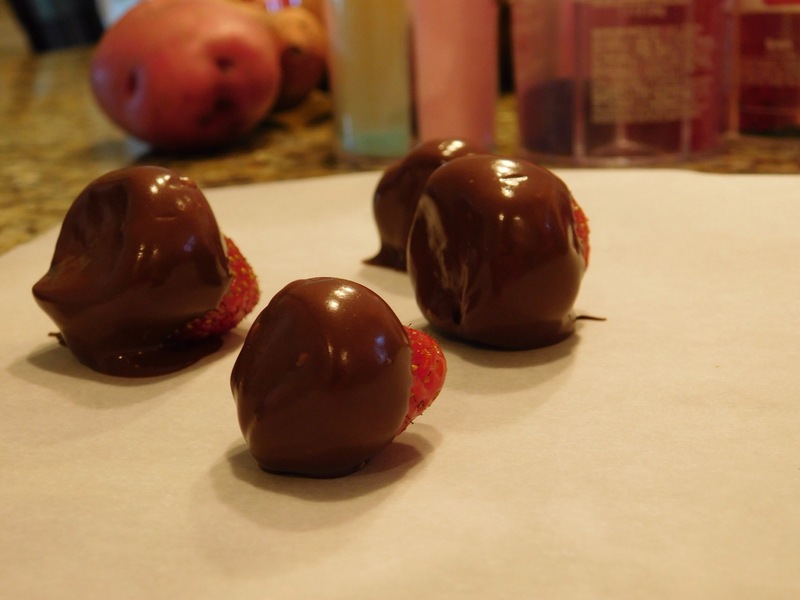 Well, after decorating, chill them in the fridge for 10-12 minutes or until chocolate is dry. Then………. EAT THEM! Well, I hope you make these because they are so scrumptious! I love the word scrumptious. 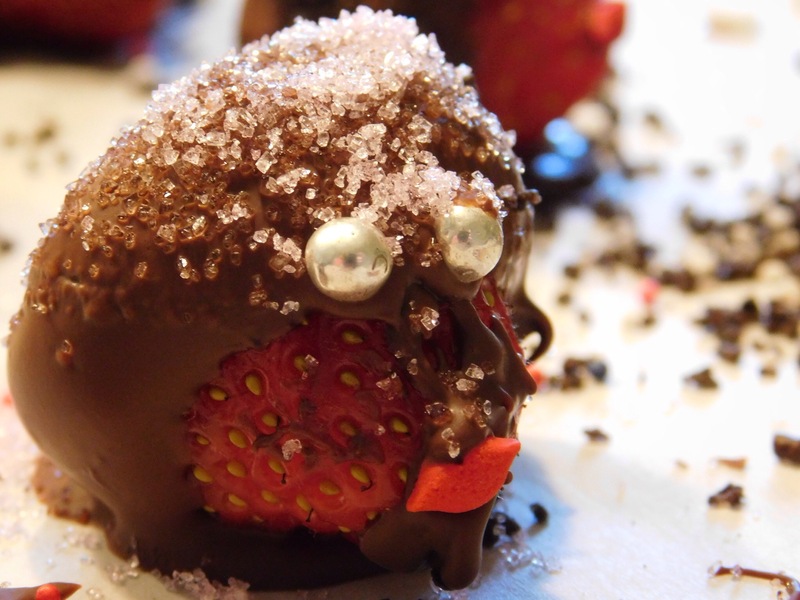 Oh, and if you make these, please comment on this post and tell me what yours look like and if they taste good. ( which they will ). Bye! Some of my friends and I made up this recipie ourselves today!